A triangle is a three-sided polygon. Knowing the rules and relationships between the various triangles helps to understand geometry. More importantly, for the high school student and the college-bound senior, this knowledge will help you save time on the all-important SAT tests. Measure the three sides of the triangle with a ruler. If all three sides are the same length, then it is an equilateral triangle, and the three angles contained by those sides are the same. So an equilateral triangle is also an equiangular triangle. An important point to remember is that, in this case, all three angles measure 60 degrees. Regardless of the length of the sides, each angle of the equiangular triangle will be 60 degrees. Cross-check by measuring the angles with the protractor. If each angle measures 60 degrees, then the triangle is equiangular and--by definition--equilateral. Label the triangle "isosceles" if only two sides are equal. Remember that the angles contained by the two equal sides (the base angles) will be equal to each other. So, if you know one base angle in an isosceles triangle, you can find the other two angles. For example, if one angle is 55 degrees, then the other base angle will be 55 degrees. The third angle will be 70 degrees, derived from 180 - (55+55). Conversely, if two angles are equal, then two sides will also be equal. Know that the equilateral triangle is a special case of the isosceles triangle since it has not two but all three sides and all three angles equal. A right triangle is also a special case of the isosceles triangle. The angles of the right isosceles triangle measure 90 degrees, 45 degrees and 45 degrees. If you know one angle, you can determine the other two. Learn that a right triangle has one 90-degree angle. The side opposite the 90-degree angle is the hypotenuse, and the other two sides are the legs of the triangle. 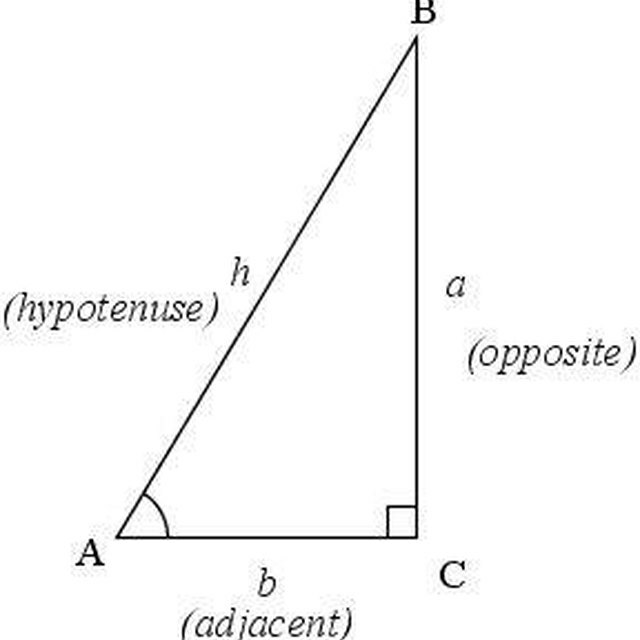 The Pythagorean theorem relates to the right triangle and states that the square on the hypotenuse is equal to the sum of the squares on the other two sides. A special case of the right triangle is the 30-60-90 triangle. Look at the three angles of the triangle. If each angle is less than 60 degrees, then label the triangle an "acute" triangle. If even one angle measures more than 90 degrees, then the triangle is an obtuse triangle. The other two angles of the obtuse triangle will be less than 90 degrees. Learn these basic properties of triangles. They will help you save time when working on geometry problems. The sum of the angles of a triangle equals 180 degrees. So, if you know two angles, you can deduce the third. In special cases, knowing just one angle will give you the other two. If you know one interior angle, then you can find the exterior angle of the triangle by subtracting the interior angle from 180 degrees. For example, if the interior angle measures 80 degrees, the corresponding exterior angle will be 180 - 80 = 100 degrees. The largest side has the largest angle opposite it. It follows that the shortest side has the smallest angle opposite it. Amit, Anjali. "How to Identify Triangles." Sciencing, https://sciencing.com/identify-triangles-5864939.html. 24 April 2017.